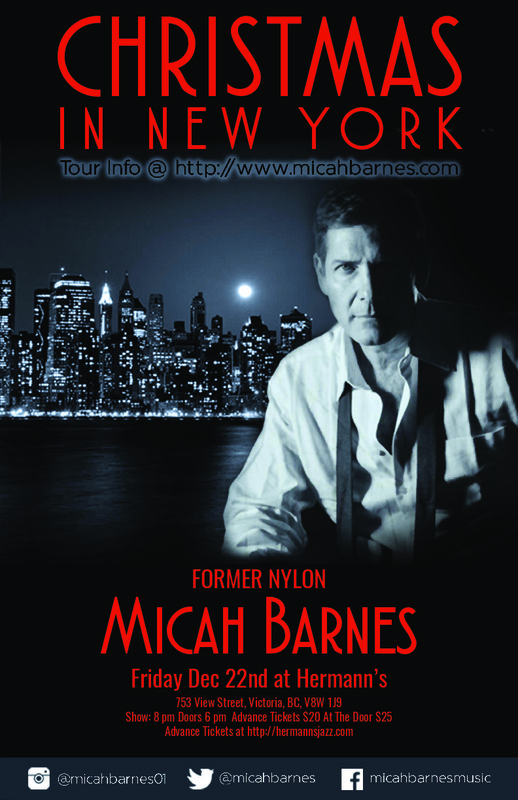 MICAH BARNES (of THE NYLONS! )- CHRISTMAS IN NEW YORK! This Holiday season let Micah Barnes take you on a musical tour through New York City! Micah's new show "Christmas in New York" includes favorite holiday tunes, Nylons classics and Jazz standards that pay tribute to the musical history of New York! Come visit legendary musical landmarks such as The Brill Building, The Savoy Ballroom, The Cotton Club, The Apollo Theatre, and Broadway's Time Square with songs that will give you that “Holiday in The Big Apple” experience! New York has long been an inspiration to musicians in the Jazz world so it's no surprise that when Micah began writing his latest disc "New York Stories" while living in the Big Apple he found the energy and the musical history of the city deeply inspiring. Living in an apartment right on the site of the legendary Savoy Ballroom and writing in a piano studio near Time Square, Micah found a deep connection to the Jazz and Blues standards written in the 30's and 40's, by folks such as Cole Porter, George Gershwin and Howard Arlen, many of which debuted at The Cotton Club or in Broadway shows. The creative explosion of Doo Wop and early R & B written and produced at The Brill Building and heard at The Apollo Theatre was also a huge influence on Micah as he composed the romantic songs that make up his chart topping eOne Music release "New York Stories"